Timothy Dalton's second and final outing as James Bond sends the agent on a personal, violent mission. Without breaking much new ground, Licence To Kill is powered by a massive engine of action and fuelled by a growling sense of fury. Bond (Dalton) is in Florida to attend the wedding of his buddy Felix Leiter (David Hedison), now with the Drug Enforcement Agency, to fiancée Della (Priscilla Barnes). On the way to the ceremony, Leiter and Bond take an unexpected aerial detour to capture South American drug lord Franz Sanchez (Robert Davi), who has come out of hiding to reclaim girlfriend Lupe Lamora (Talisa Soto) from another lover. 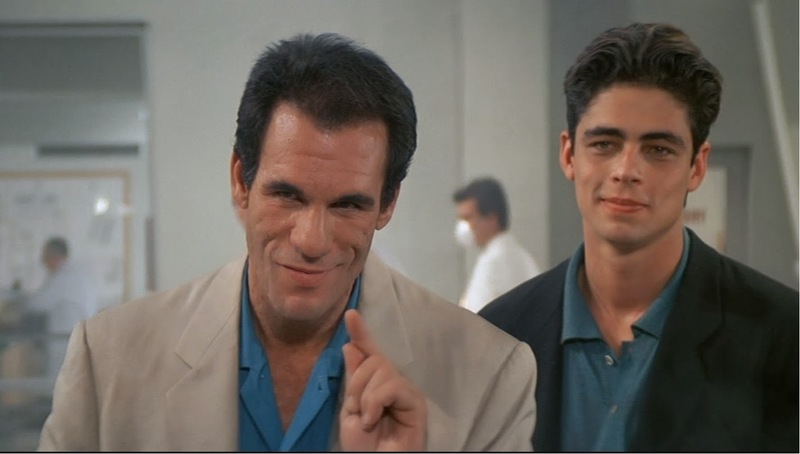 But it doesn't take long for Sanchez to bribe DEA agent Ed Killifer (Everett McGill) and make his escape, and he sends henchman Dario (Benicio del Toro) to extract revenge on his captors: Della is killed and Leiter is seriously hurt. When MI6 refuses to approve Bond going after Sanchez, he splits from the agency, and embarks on an unsanctioned mission. Bond teams up with Leiter's friend Sharkey (Frank McRae) and tracks down Milton Krest (Anthony Zerbe), a marine biologist using his fake seaborne research activities as cover for importing Sanchez' drugs. Bond then joins forces with pilot and former agent Pam Bouvier (Carey Lowell), and they travel to Isthmus City to try and infiltrate Sanchez' operation. But the drug lord owns the town, including the bank and the casino, and even with the surreptitious help of Q (Desmond Llewelyn) it will not be easy for Bond to take down a complex drug manufacturing and exporting business, which Sanchez is about to expand to Asia. In his fifth and final outing as Bond director, John Glen veers the series towards a darker, more violent place. While not new to the action genre, introducing more brutal elements to Bond gives Licence To Kill an interesting edge. One man dies by exploding on-screen due to sudden depressurization, another is devoured by a shark, and a third is crunched up by a giant shredder. There is plenty of visible blood and gore compared to the usual sanitized Bond adventure, as both Glen and Dalton grit their teeth and leave their final bloody marks on the series. The result is a more serious tone, consistent with Dalton's rather humourless persona. Licence To Kill is also distinguished by being one of the few missions in which Bond is the driving force, prompted into action by the need to impart personal revenge. He decides to go after the empire of Sanchez to seek frontier justice on behalf of Felix and Della, breaking with direct orders from M, without the usual "two weeks time off" wink and a nudge approval. Far fetched as it is, Bond's seething anger creates a different emotional resonance to the movie. The climax is also relatively unique, Bond attempting to stop four large tanker trucks filled with a cocaine and gasoline mixture as they hurtle down winding roads in a free-wheeling high speed escape. Talisa Soto as Lupe Lamora and Carey Lowell as Pam Bouvier provide Bond with a brunette and a blonde to cavort with. Both are reasonably resourceful, and the usually flippant Bond finds himself in a bit of a curious lust triangle. Despite the points of interest in the movie, Licence To Kill also struggles against several weaknesses. Dalton is generally unengaging, going through the movie with a single set expression on his face, whether he is angry or jubilant. The fall-out with M and MI6 is pushed to ridiculous levels, Bond immediately engaged in a shooting match with his former employers. And there is a superfluous fake televangelist, Professor Joe Butcher (Wayne Newton), needlessly worked into the Sanchez operation, the Bond franchise taking cheap shots at an all too easy target. Even on a personal mission Bond will always have his Licence To Kill, and here he puts it to use with a grim determination to display the disturbing violence that can accompany killing with extreme prejudice.